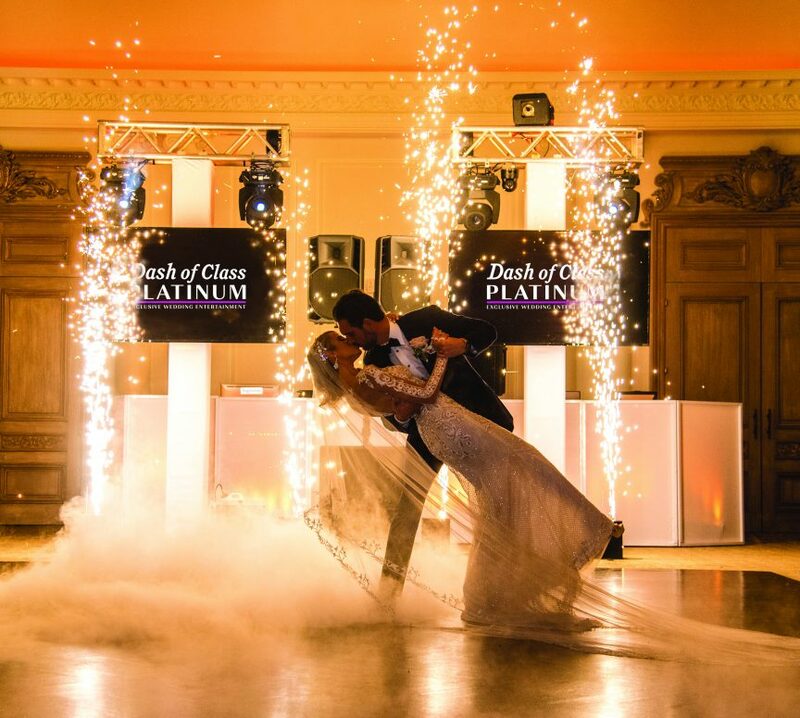 Bring your wedding reception to the next level by adding the excitement & flare that only Special Effects can. Enhancements like automated lighting, dancing on clouds, indoor sparkulars, snowfall effect, CO2 jets, confetti blasts, and LED robots can amp up your reception. Making it super memorable and FUN! Automated lighting will add ambience to your ballroom. Tied into your color theme as well as add a theatrical lighting effects from spotlighting your first dance to adding high energy dance pattern excitement during dance sets coordinated with the music tempo being played by the DJ. Create the ultimate in personalization to your event. Project your name or initials through light onto the dance floor or walls of your venue. With Specialty Lighting you can add sophisticated uplighting that will add a warm ambiance that will enhance and coordinate to your wedding colors. Also elegantly pinspot your table centerpieces or incorporate custom static image projection to give your venue a unique look & feel. A true fairytale addition to your First Dance with a low lying fog effect to capture some spectacular pictures to last a lifetime. An amazing addition to your Grand Entrance or First Dance with indoor spark fountains that will wow your guests and provide amazing photos. They are 100% safe, no flame, no smoke. This theatrical element shoots plumes of cool white smoke for your grand entrance as well as during high energy dance sets to cool off a rockin’ dance crowd. Handheld CO2 guns are available for the bride & groom to cool off their guests and excite their dance floor. Let It Snow anytime of the year for a winter wonderland effect during your first dance or during dance sets. Blast off a spray of streamers and confetti to highlight a special moment at your reception. Available are handheld canons for your guest’s to shoot off or automated canons as well. LED Robots will take over & illuminate your dance floor as they add excitement while dancing with the bride & groom and their guests. These fun and entertaining special effect are available with CO2 club cannons to cool off a hot dance set. Unique reception ideas & details such as these can give your wedding a different vibe from all the others when they are incorporated professionally & elegantly.